Usually, all the excitement centers around overclocking a processor; that is, seeing how much headroom a chip has for higher core clock rates. As we all know, CPUs and GPUs are both types of processors, and enthusiasts love tweaking both. While there are many guides on overclocking a graphics card, the same can’t be said for underclocking. Underclocking a graphics card is a great way to rein in high temperatures and reduce power consumption. For gaming, this can create a better per watt efficiency while keeping your gaming experience quieter. Underclocking can be useful for laptops as well, where thermal envelopes are more crucial. Note: every GPU is unique, and your mileage with stability and performance will vary. Additionally, many older cards cannot be undervolted. 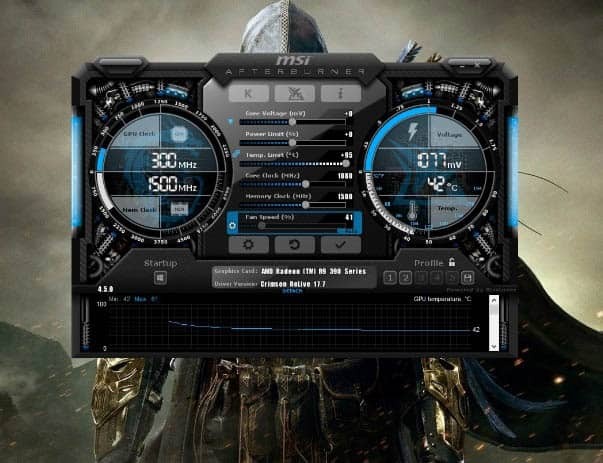 Using MSI’s Afterburner allows power users to adjust many variables with their cards, including voltage. Also, clock and memory speeds can be adjusted, as well as making a custom fan curve – which we’ll get into in a bit. There are other alternatives: EVGA Precision XOC, NZXT Cam, and ASUS GPU Tweak to name a few. However, Afterburner has become the gold standard. Afterburner is also based on Riva Tuner, which is an opensource overclocking and hardware monitoring software that supports a wide gamut of GPUs, both from Nvidia and AMD. For the context of the guide, we’ll assume the use of Afterburner, as it’s an excellent utility. Get the latest version here. Clock and memory speeds are listed to the left, with voltage and temperature to the right. All the adjustable functions are centered between these two. At the bottom, the temperature is plotted over time, which is helpful in identifying thermal spikes and measuring how effective fan profiles are. Towards the bottom is the slider for adjusting core clock speeds, which is what most people want to do when shooting for a simple underclock. Taking the slider all the way to the right increase the clock speed to the card’s supported limit set by VBIOS. Taking it the left will decrease the clock speed. Adjust the clock speed to the desired level, and test for stability. This slider can be adjusted left or right, decreasing or increasing voltage in millivolts. Most cards will only permit adjustments in multiples. For example, for this R9 390X its 6 (e.g. 6, 12, 18 and so on). This is a setting dictated through firmware and VBIOS, and in most cases, it can’t be changed. When the slider is adjusted to the left, it will apply a negative voltage offset in the specified amount. Lowering the target voltage of a GPU is known as undervolting and is often done alongside underclocking for maximum efficacy. Once a core clock (and voltage, if desired) amount is specified, click the check mark towards the bottom right to apply the changes. Underclocking a GPU should theoretically translate to a cooler card, but almost always not as cool as it could be. 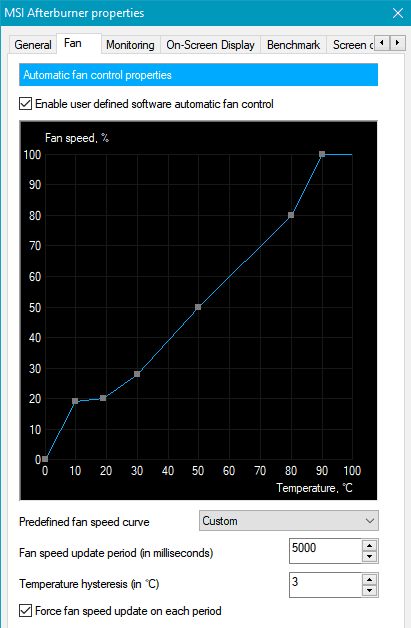 That’s why it’s worth the trouble to set a custom fan curve. Click the gear icon underneath the fan speed slider to access the settings. From there, go to the fan tab. A 1:1 fan curve looks something like this and will ensure the card is running as cool as possible. Granted, a 1:1 curve is a bit aggressive, and may be too loud for some. Feel free to play around with whatever ratio strikes the best thermal/audible balance. The easiest way to test for stability is to run a game or application while monitoring temperature, clock rates, and voltage. If you experience crashes, adjust the clock rate (and voltage if necessary), and repeat the process until the lowest possible underclock is achieved. Not everyone needs an overclocked GPU. Laptop gamers and cryptocurrency miners are among a few examples of who can benefit from underclocking and undervolting. Although, anyone can enjoy the benefits of lower power consumption, quieter cards, and less heat waste.